It's week three of the My Signature Sampler sew along and I'm so pleased to see all the gorgeous blocks being posted on Instagram--they're all so amazing! 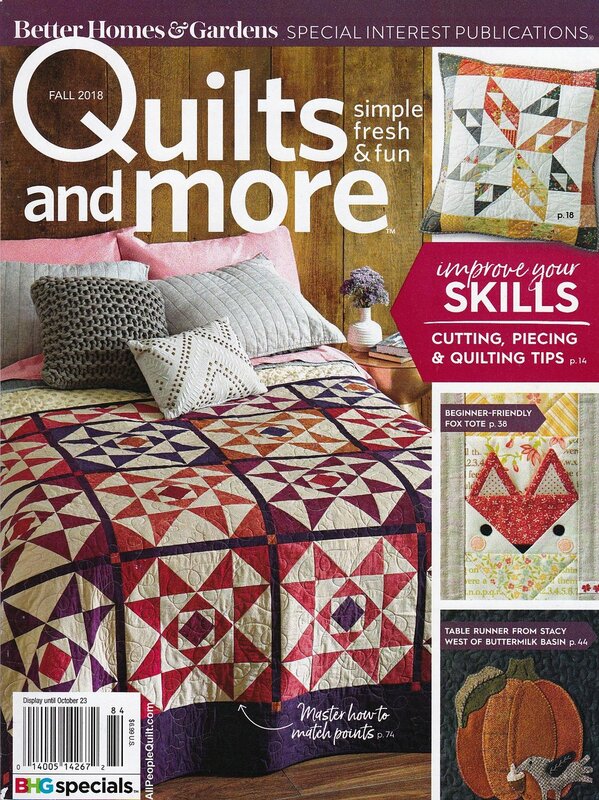 This week's block pattern comes from The Quilter's Planner 2018 magazine and is a traditional quilt block from way back, called Old Maid's Puzzle. I've used prints from my Signature fabric collection from Art Gallery Fabrics in the butterfly shapes and Sweet Macademia Pure Elements solid as my background. For stock lists of online shops that carry my Signature and other AGF collections, visit my Fabrics page or the Where to Buy page on the Art Gallery Fabrics site. This week's My Signature Sampler giveaway will put this beautiful Lemon Green Edition Color Master box of 10 fat quarters into one lucky winners stash! This Giveaway's now closed. Congratulations to Lori Morton! That’s FOUR possible entries! Enter now through Monday, July 9th! The winner will be picked at random around 4pm Eastern. I will post the name of the winner on this post once they've been notified and responded to my email. 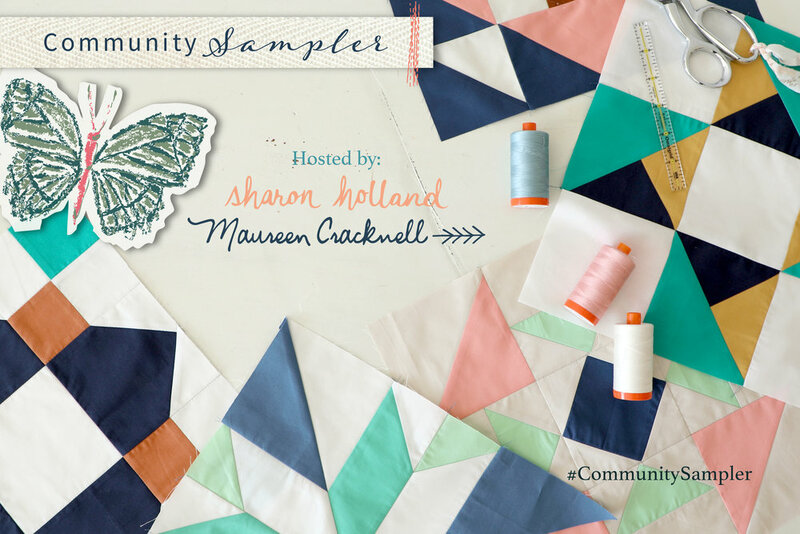 You've nearly finished or better yet, you've finished both your Sewcial Bee Sampler and Community Sampler, now what? 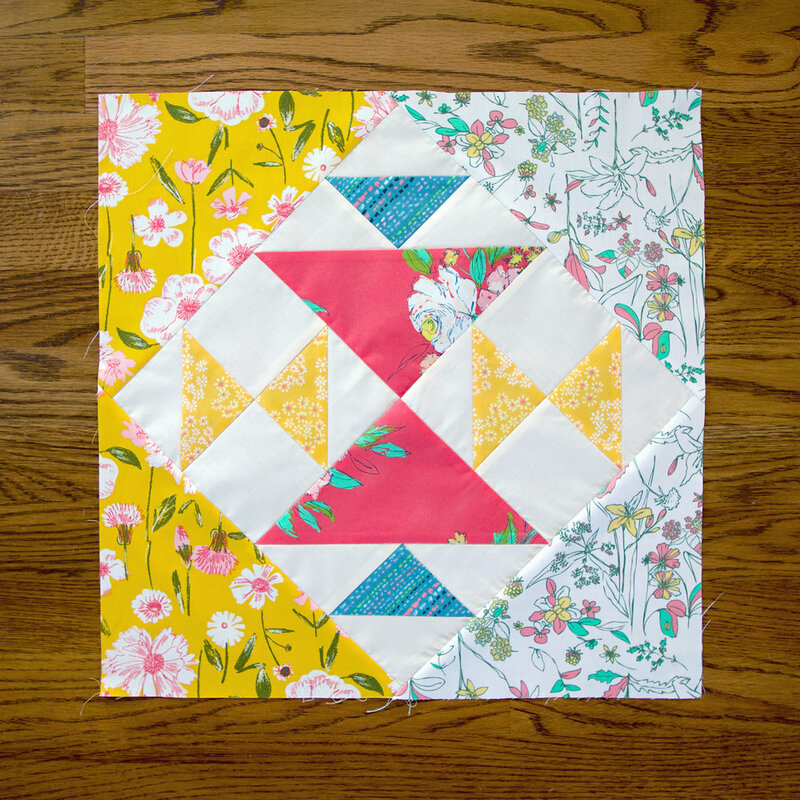 During those sew alongs, did you find yourself saying "This is my favorite block, yet!" or "I could make a whole quilt from this block!" Well, now's your chance to explore those blocks further and even try out some new blocks. 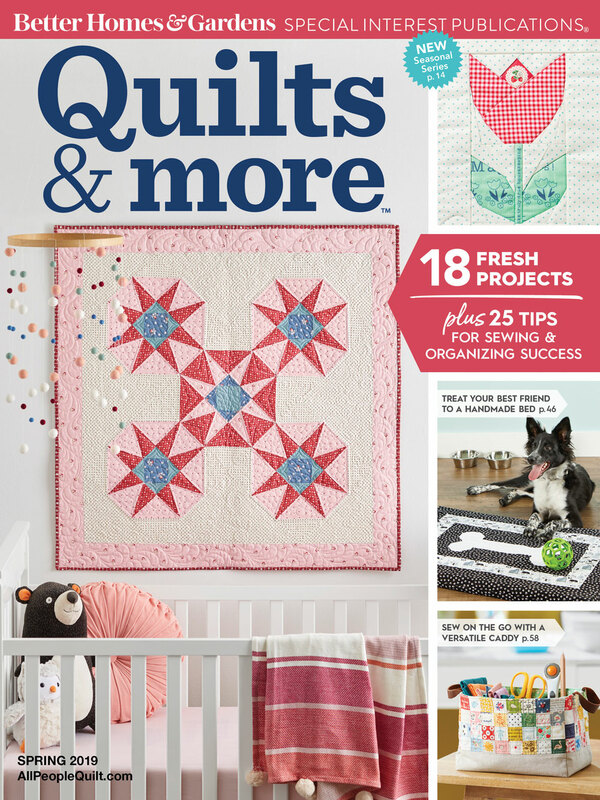 You can create your own sampler quilt or sew along with me as I make my sampler. 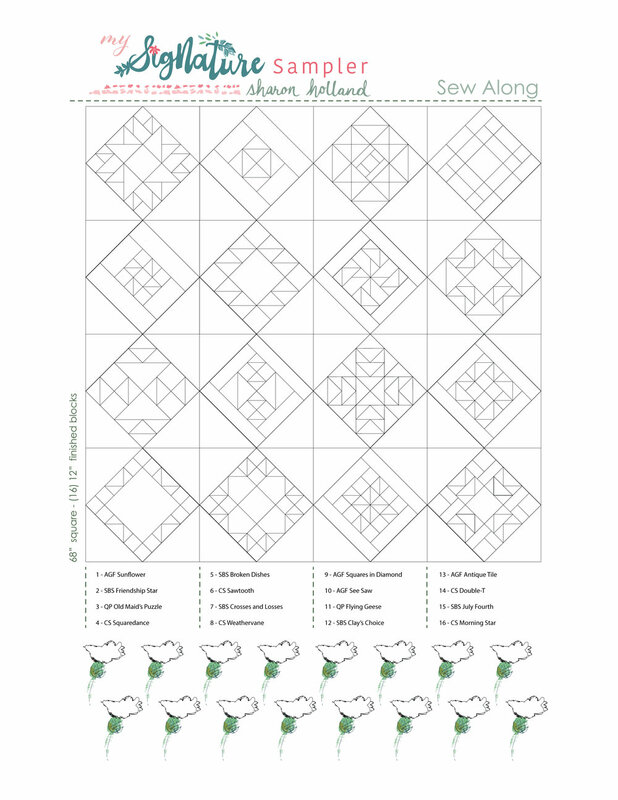 I've made a handy-dandy fabric and coloring book page for you if you want to make a quilt with the same blocks as mine. Both the colored (fabric) version and blank version have a block list that contains the block's sources and week order in four columns below the illustration. I've even included fabric information for the materials I'll be sewing with on the colored (fabric) version. Since this is not a structured sew along like in the past two events I cannot possibly know everyones fabric requirements as quilt block selection and sizes will vary. 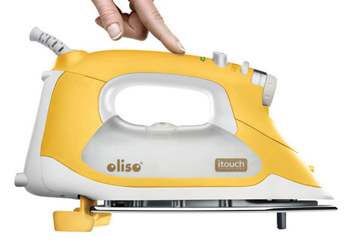 The following is a close proximity of material required for a sampler like the one I will be making. I've figured fat quarters for easy reference but this is a generous figure. All blocks are 12-1/2'' unfinished, that includes the frames on some of the blocks. By having this multitude of blocks available to you at the beginning of the sew along, you're able to work at your own pace. Maybe you want to make all the blocks in one week--that would be amazing! Or, maybe you prefer a one-block-a-week approach and spend more time outdoors with the kids--totally cool! 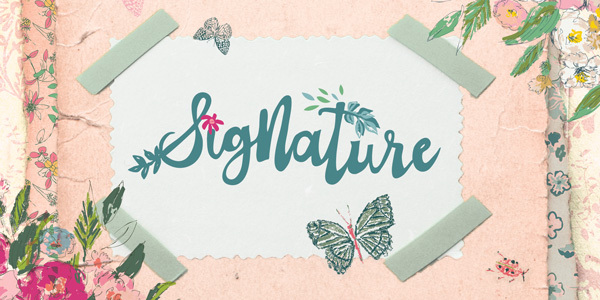 My Signature fabrics are all about the natural world and gardens. 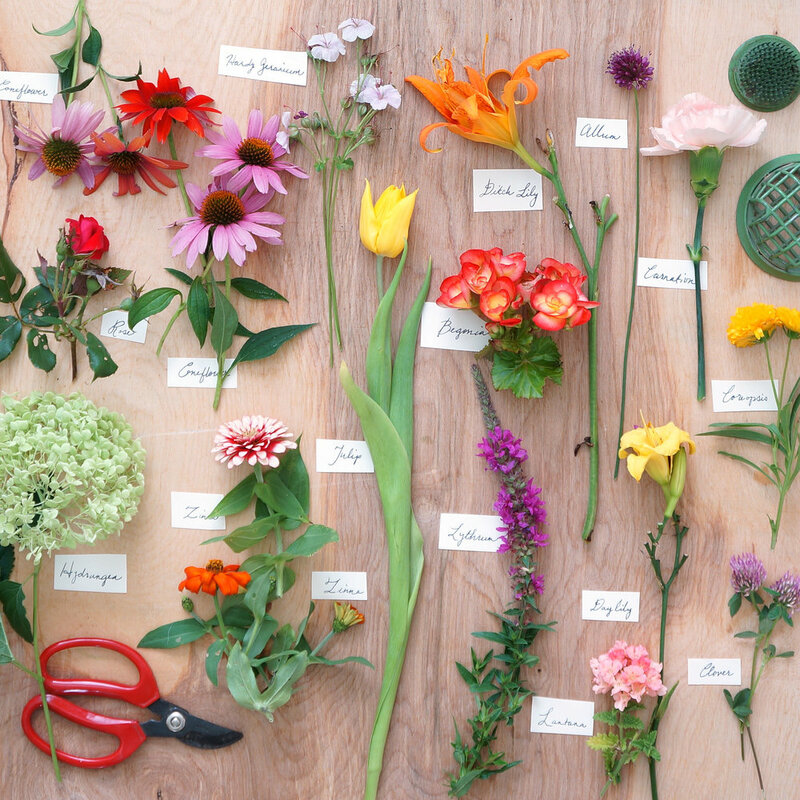 I want my quilt to capture the abundance of flowers now blooming in my yard so I can celebrate this same joy all year round and this flat lay photo of cuttings from my yard is my inspiration for my fabric selections. This entire sew along concept came after I made my own version of the above Sunflower block from the AGF Quilt Block Collection. If you'd like to add this block to your sampler, use the provided link to watch a You Tube tutorial for how it's pieced as well as detailed cutting instructions on the drop down More feature in the text. 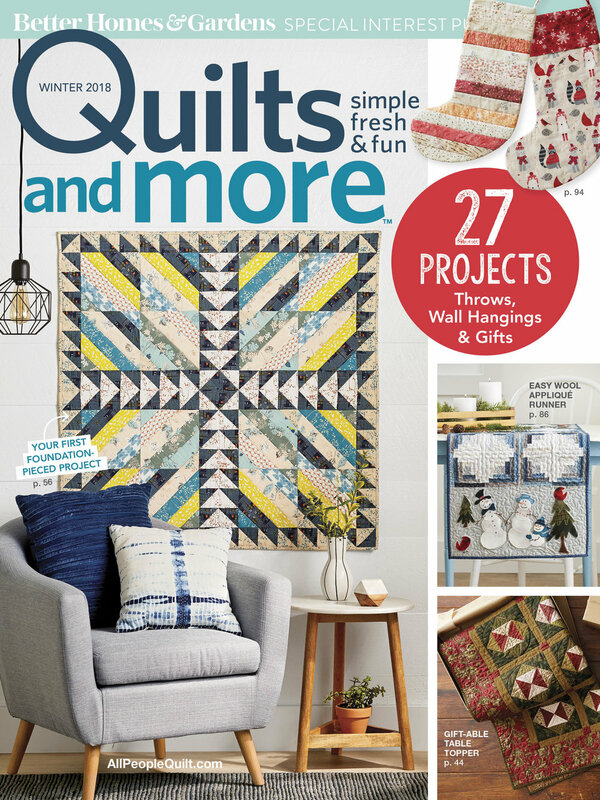 Using the previously written PDFs for past samplers, AGF block tutorials, and the beautifully written and illustrated Quilter's Planner block of the month instructions that frees me up from writing and let's me have more fun this time around. 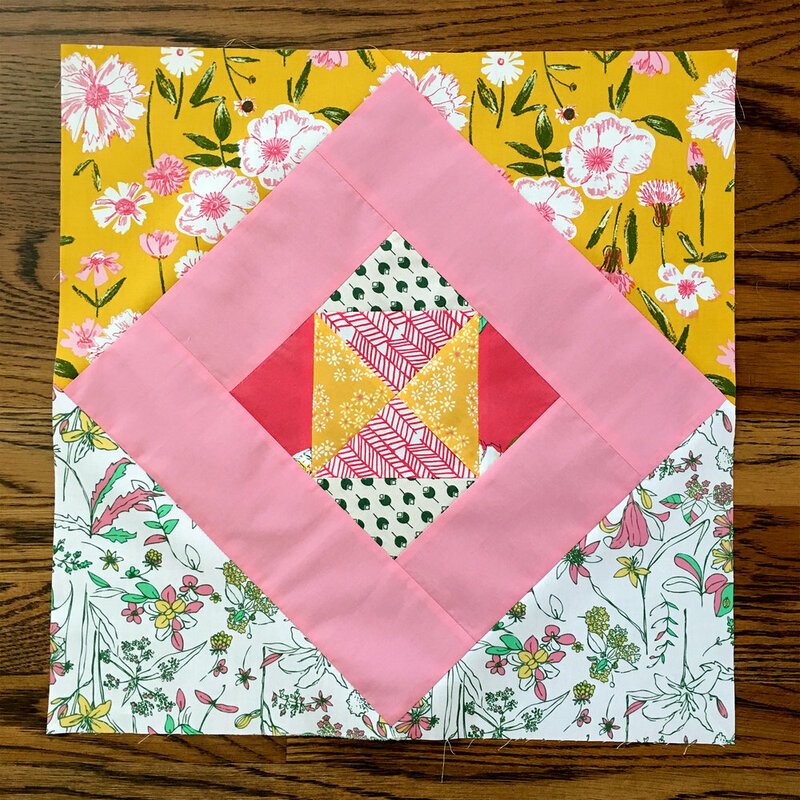 Each week I will provide links to the various blocks I put into my sampler and if I've made any variations to the original block instructions I will give you that information in the blog post. 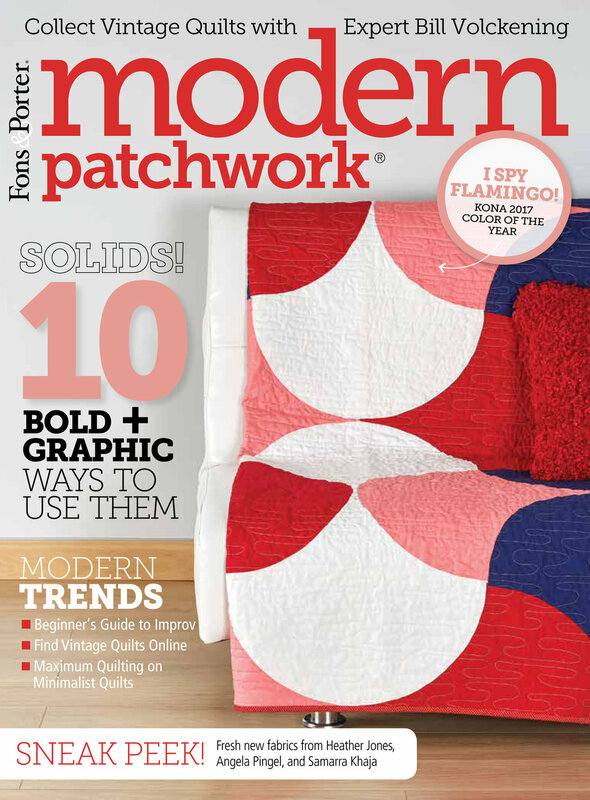 For a listing of online shops that carry my Signature collection, visit my Fabrics page. Due to putting this sew along together so quickly, I'm still waiting to hear back from some sponsors. Expect this already impressive list of generous sponsors to fill out over the next couple of weeks. 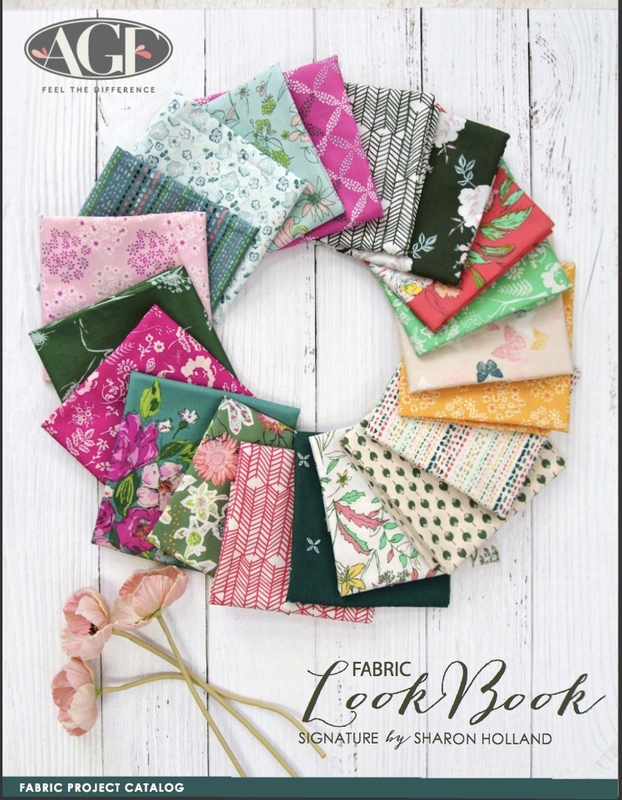 To get you sewing on the right foot and entice you to sew your sampler with Signature fabrics (wink, wink) I'm giving away a 20-piece fat quarter bundle of my Signature fabrics for Art Gallery Fabric plus an additional fat quarter of Perennial Printemps (not shown in image above) for a total of 21 fat quarters! This lucsious Signature collection comes in two color ways. On the left is the Foliar color way of coral, yellow, and forest greens. The stack on the right is called the Atmospheric color way and is cooler tones of turquoise, teal, fuchsia, and pink. I've mixed a bit from both color ways into my sampler and added the recolored Printemps Fusions version of my Bountiful Perennial print (shown above on the bolt) to bring in more yellow to go with the Signature Lacey Cosmos print (top right). This Giveaway is now CLOSED. Congratulations to Maxime Suchoski! 4. Help spread the word!! I know that many of you already do, so I thought it would be nice to add that as another way to enter! 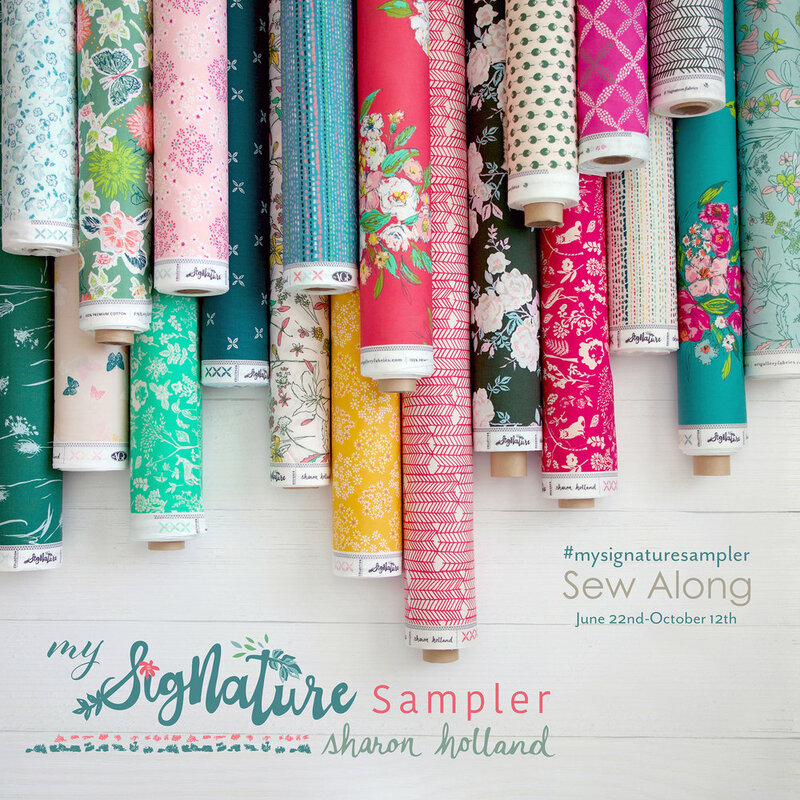 Spread the word about the My Signature Sampler sew along on YOUR instagram, Facebook, Twitter, Pinterest, blog post, etc... (separate comment-fourth entry). That’s FOUR possible entries! Enter now through Monday, June 25th! The winner will be picked at random around 4pm Eastern. I will post the name of the winner on this post once they've been notified and responded to my email. Thanks for sewing along with me! 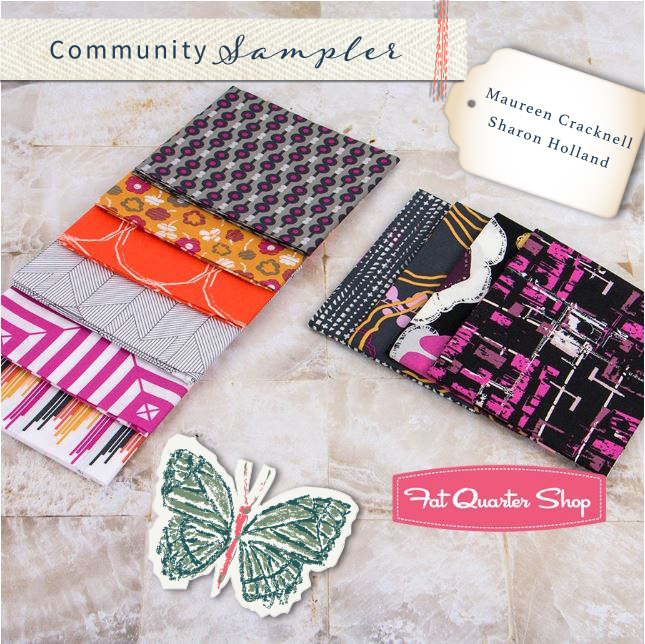 TODAY'S FEATURED COMMUNITY SAMPLER SPONSOR IS THE FAT QUARTER SHOP! We hope you enjoy visiting Fat Quarter Shop! 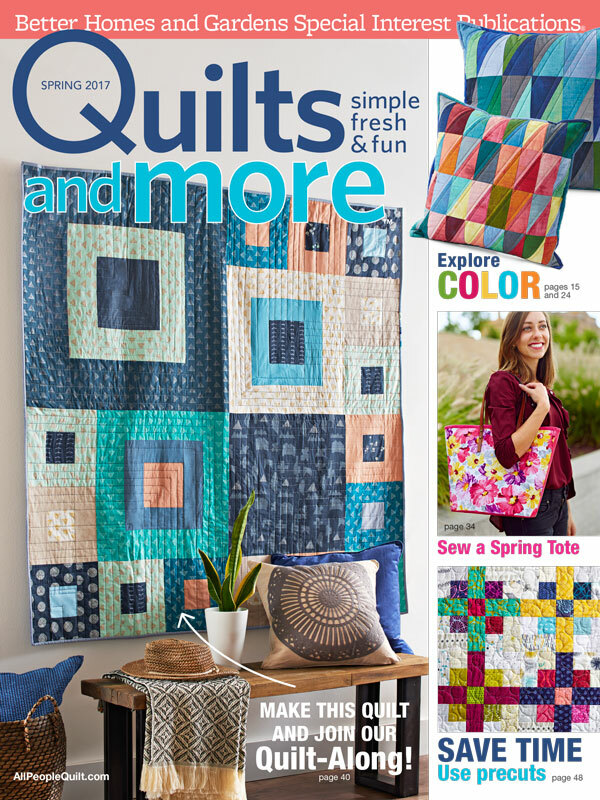 This week the Fat Quarter Shop is generously giving away this fun, 10-pc City Loft Fusions bundle. Art Gallery Fabrics has curated bold and eccentric prints from the various AGF designers you love to bring you the essence metropolitan chic in City Loft Fusions. Trendy florals and striking geometrics are colored in saturated plum contrasted by edgy grays and touches of orange for contemporary sewing.